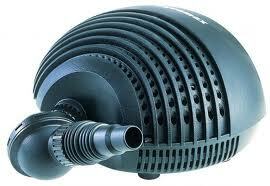 There are two types of water pumps, submersible and external pumps. As a rough guide, ponds less than 8000 litres use submersible pumps, and larger ponds can use powerful submersible pumps or an external, low noise, 24-hour rated pump. Choose a pump that has a warranty period of at least 3 years. Most of our pumps have between 3 and 5 years warranty, which is a good indication of the quality and expected lifespan. In most cases, pumps that have 1-year warranty are of poor quality and are often energy inefficient, wasting energy and therefore money, but also risking the health of your fish. Electricity prices are rising. Generally, more expensive pumps are more energy efficient. Running a pump 24 hours costs around $1.20 per watt per year (a bit more or a bit less in different states), so take this into consideration when thinking of how much you are going to spend on your pump. When selecting a pump for your pond, firstly, you should try to estimate the flow rate you will require. Flow rates for pumps are measured in litres per hour. One way of estimating the flow rate you require would be to get a bucket of water of known volume, and time how long it takes to pour the contents of water out of the bucket at approximately the same flow rate at which you want your waterfall flowing at. For example: If you try this with a 10-litre bucket, and it takes you 10 seconds to pour the water out, the water will be flowing at 1 litre per second, or 60 litres per minute, which is the same as saying 3600 litres per hour. Now we must measure the height of your waterfall, measured from the surface of the water in your pond, vertically to the top of your waterfall where the water spills from the tube or pipe feeding it. This is called the “static head height” of the waterfall. 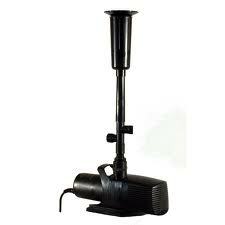 All pumps have a maximum head height at which they will pump water. The higher a pump has to pump water, the less it will flow until it reaches its maximum head height, at which point, the pump will actually stop flowing. ie, If you have a 1-metre waterfall, do not buy a pump that has a max head height of 1 metre! Another factor that we must consider is the “frictional loss” of your pump, which is the loss of flow from your pump due to the friction of water with your pipes and filter. The more pipework you have and the finer your filter media, the greater the frictional loss will be. The frictional loss is difficult to measure but is worth keeping in mind, especially if you a lot of pipework, or pipes of smaller diameter to what your pump will run at its peak. The combined effects of static head loss and frictional loss are referred to as “Dynamic head loss”. Come into our store to find out more. Another example: If we want a flow rate of 3600 litres per hour flowing down a waterfall that is 1.5 metres high, we do not buy a pump of maximum flow of 3600 litres per hour, with a max. head height of 2 metres, because this may only pump out 500 to 1000 litres per hour up to your waterfall. Instead, a pump that will pump a maximum of 5500 litres per hour with a max. head height of 3 metres would be more suitable, as it would give you a flow rate much closer to the flow rate you desire. If you are using a pump for the purposes of biological filtration, the flow rate of the pump must be at least enough to turn the entire volume of your pond over at least once per hour, preferably twice or so. For example. If you have a pond of 2000 litres, a waterfall of 1-metre height, you would need a pump of at least 3000 litres per hour to adequately filter the pond, preferably more. At The Fish Works, we only stock the best brands in pumps and filters. We prefer to stock brands that have long warranty periods, with low power consumption.